The Wheelock Aqueduct on the SUC Middlewich Branch, February 2012. 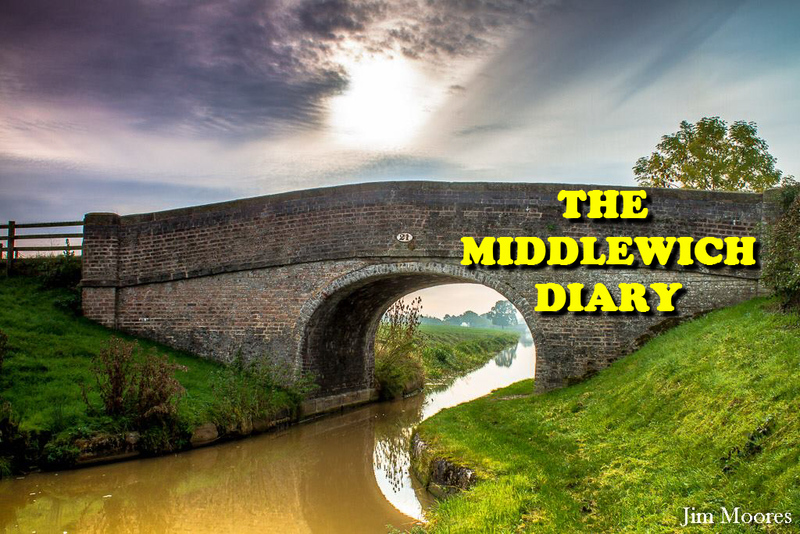 'The Canals & Rivers of Middlewich' and here he's giving us all a glimpse of one of the three aqueducts in the town - one we've talked about in several previous Middlewich Diary entries but have never had the chance of a proper look at, until now. Like so many such places around our town, the SUC* aqueduct over the River Wheelock, just yards away from the much better known (for obvious reasons) Nantwich Road aqueduct, is a 'hidden gem'. The Nantwich Road aqueduct is lacking these stone pillars and the opulent curves on either side of the road, presumably because of space constraints in the narrow cutting in which it lies. According to George Nash (see above), the road aqueduct is, in any case, smaller than the one over the river. 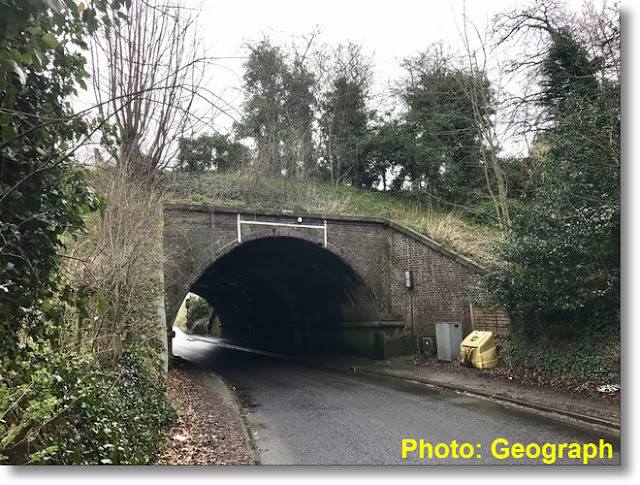 It seems strange, though, that the river aqueduct, out of sight of the general public, should be given these embellishments and the Nantwich Road one left unadorned. 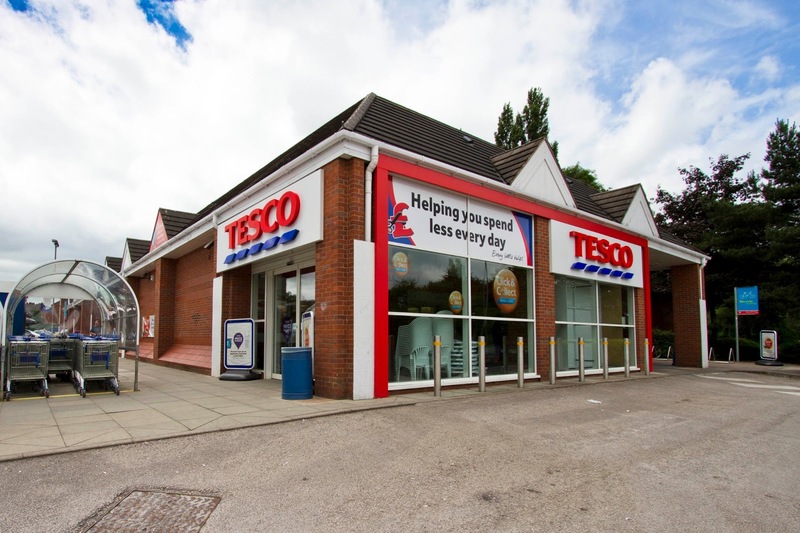 In the early 1960s,when I was still at Wimboldsley Primary School I remember playing around this aqueduct with a group of friends. One of our ambitions was to walk through the aqueduct from one side to the other along the middle of the river. We never did it, as we were unsure how deep the river was. 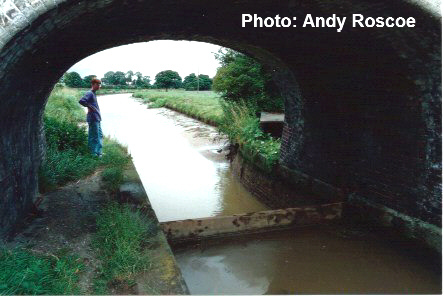 In those days, just a short distance into the tunnel (both these aqueducts are more like short tunnels,burrowing into the canal embankment, than bridges) on the Wimboldsley side was what looked very much like an abandoned boat. 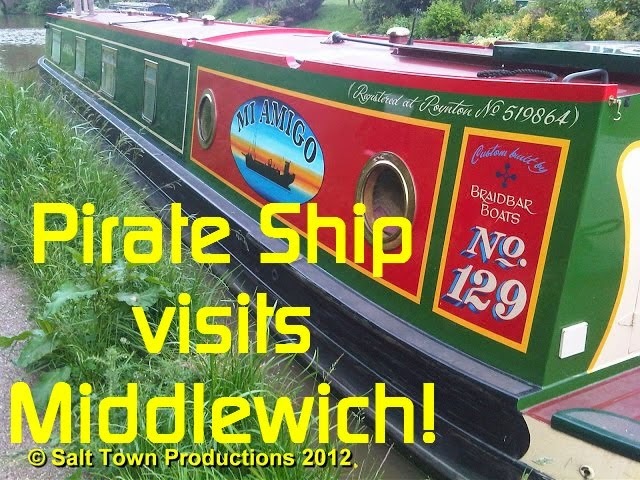 Another of our ambitions was to rescue this boat, repair it, and go sailing all around the canals and rivers of Middlewich,like our heroes the Swallows and Amazons. 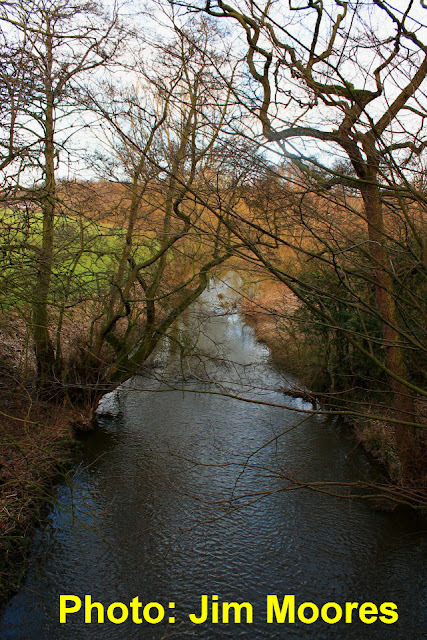 Jim's third photograph shows the River Wheelock flowing on from the aqueduct and heading off towards its meeting with the River Dane at Croxton. 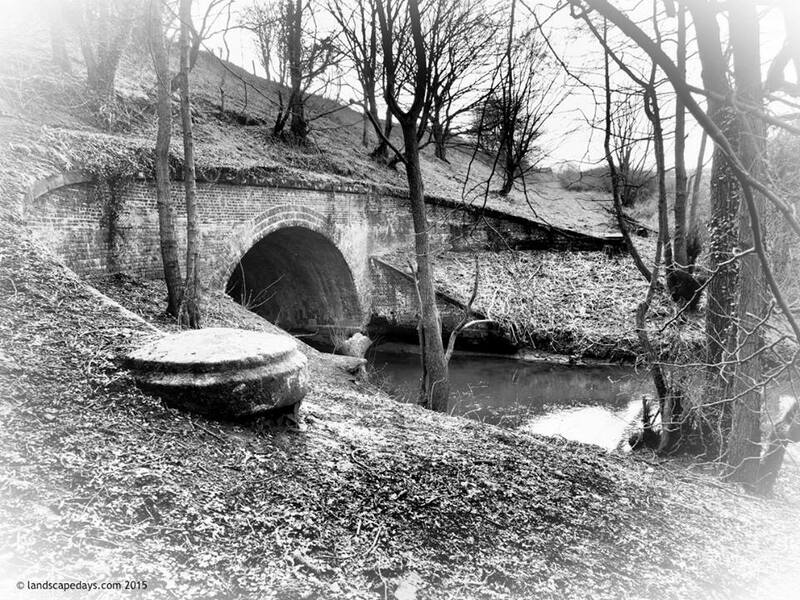 Note: This entry started a discussion in the 'comments' section (see below) of a 'tunnel' under the canal in or near Norman's wood. 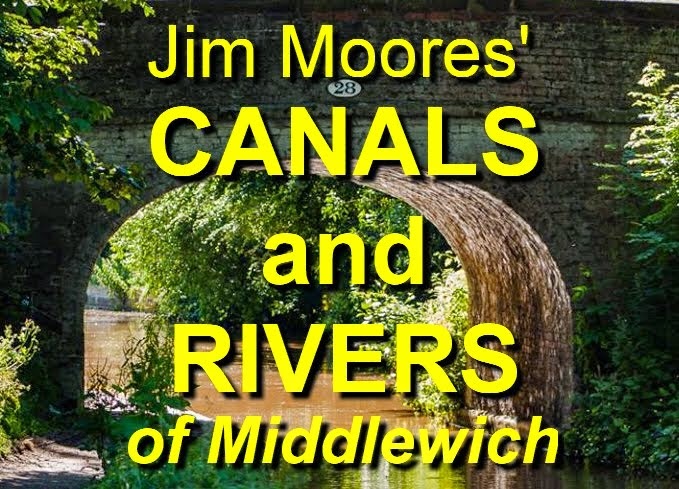 Jim Moores' Canals & Rivers of Middlewich' Facebook page has photos. The Norman's Wood 'tunnel' under the SUC Middlewich Branch at Norman's Wood. 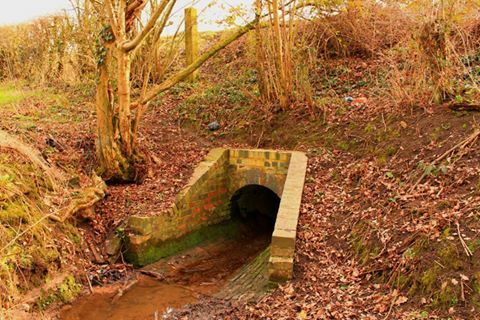 Is it a tunnel, or more properly a drainage culvert? 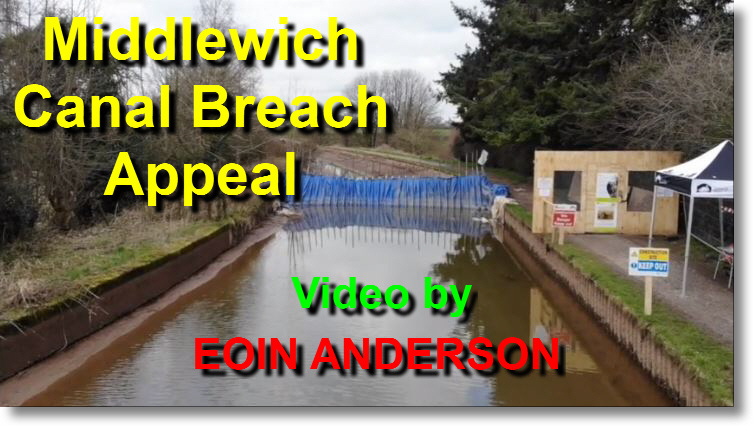 Labels: ANDERSON EOIN, CANAL & RIVER TRUST EMERGENCY APPEAL 2018, SUC EMERGENCY APPEAL VIDEO. 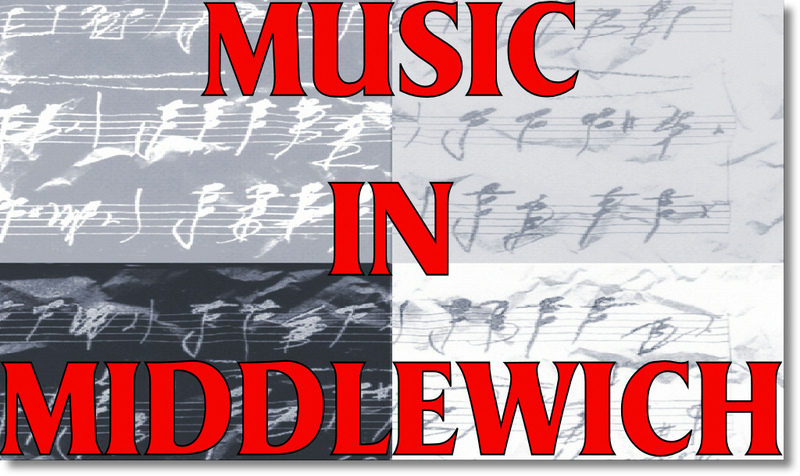 This is the first music weekend I have organised in quite a while! Session and Singaround ‘first Sunday in the month,’ bring any instruments, bring your favourite songs and join us for this ‘sing-around’ style session. 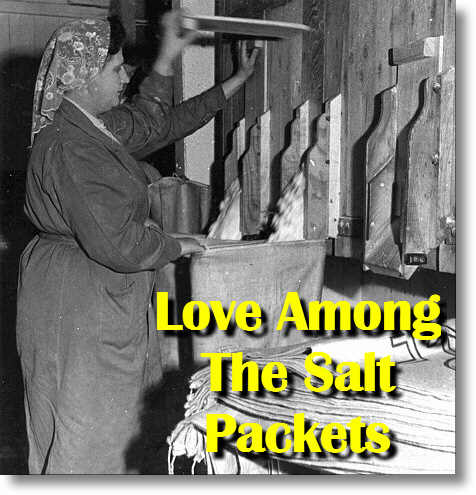 Everyone welcome to join in or listen. 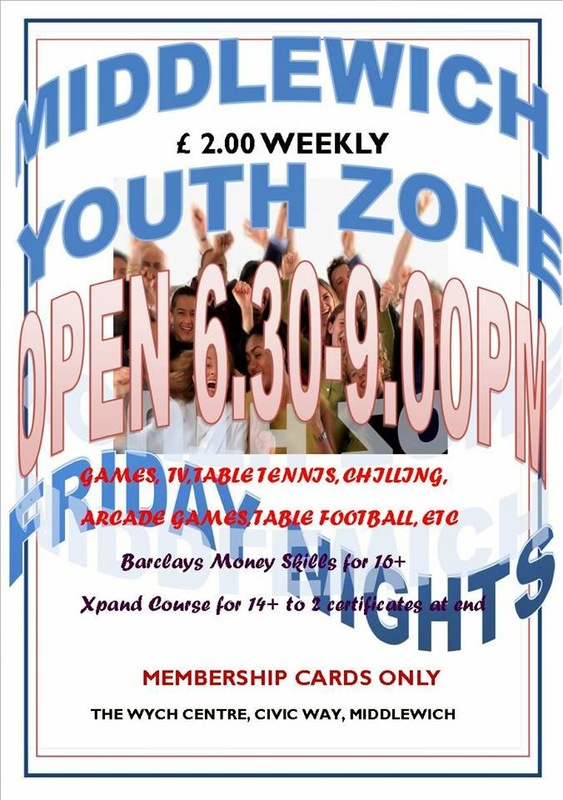 8pm – late! 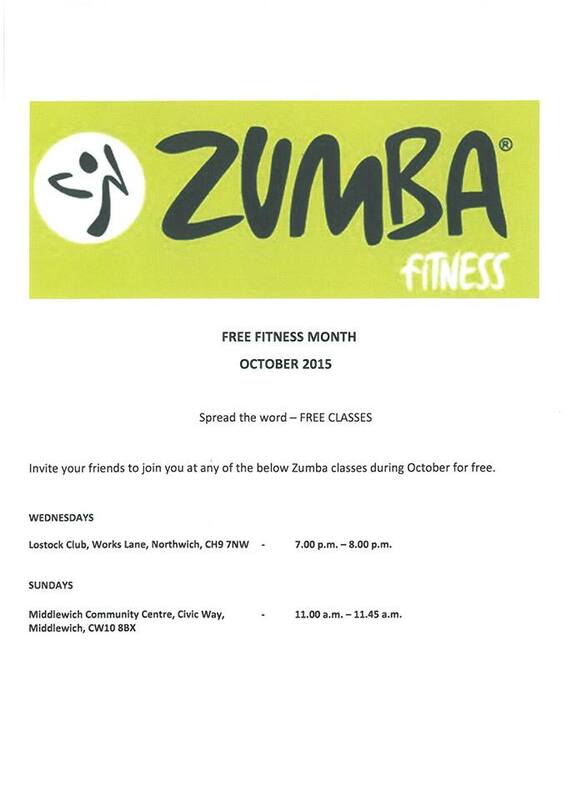 As this Sunday session is followed by a bank holiday, we may stay up extra late!! 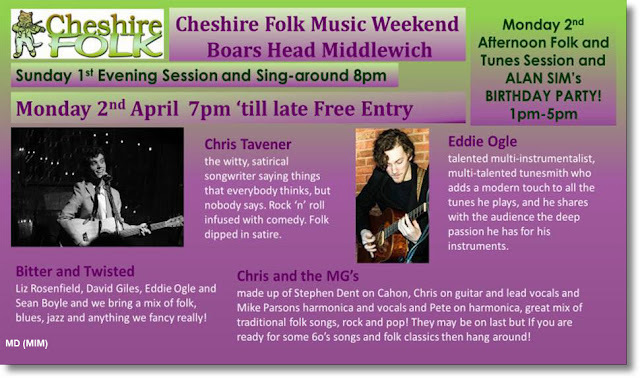 Easter Monday - 2nd April FOLK AND TUNES SESSION and ALAN SIM’s BIRTHDAY FUN! 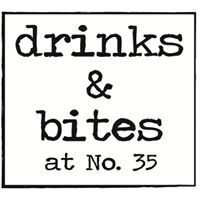 Afternoon session, music, fun and food ‘folk’ tunes and songs session from 1pm – 5pm, traditional celebration of Alan’s birthday, followed by ‘tea’ and fantastic guests and bands in the evening. We are combining the afternoon session with the annual ALAN SIM’s BIRTHDAY SESSION and we will all be welcome to invite whoever we would like to. 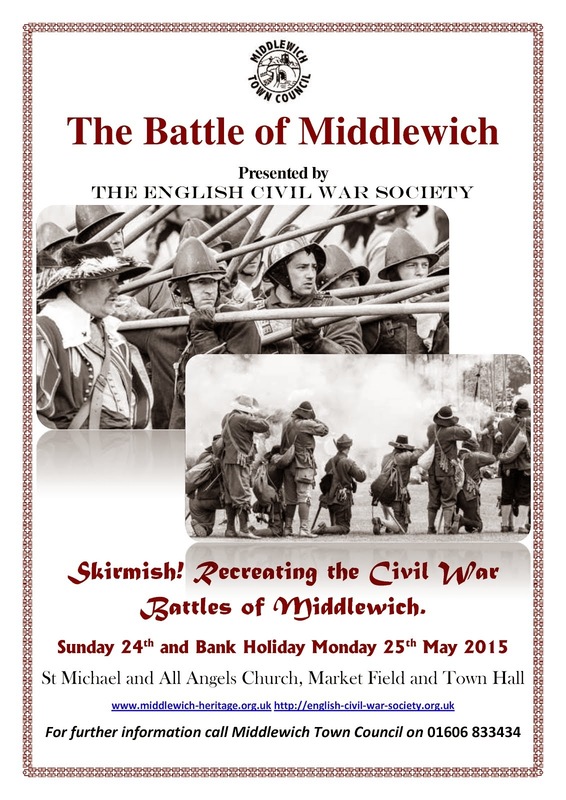 MONDAY EVENING 2nd April– sit back and be entertained! 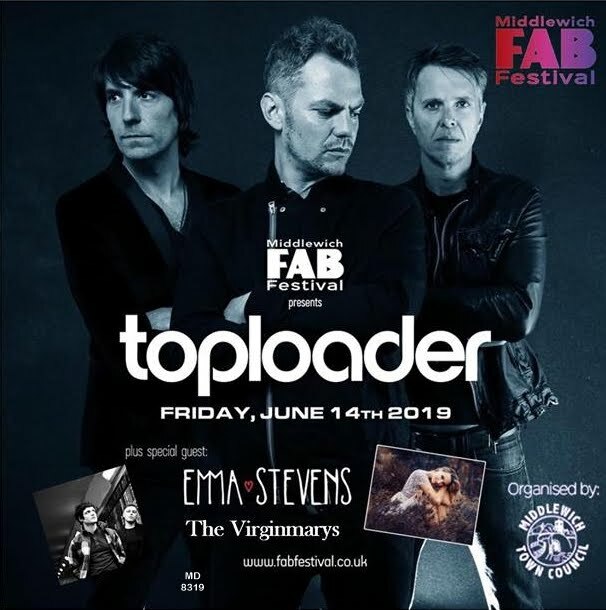 Looking forward to a great weekend of music! Middlewich SUC Branch Breach March 2018. There is, of course, no shortage of photographs of this most spectacular of canal breaches, and here are some of the best yet, produced by drone photographer John Bancroft, who lives in Northants but took the opportunity to photograph the scene while on a visit to relatives in nearby Moulton. The high resolution shot (above) looks almost like an impressionist painting and covers virtually the whole of the affected area - the only exception being the stretch between the stricken Wheelock aqueduct and Stanthorne Lock, which is out of shot at bottom right. By the time John took this photograph the temporary dam (top left, close to the Nantwich Road aqueduct) was in place and water had been pumped from the Trent & Mersey to enable stranded boats to leave the canal via Wardle Lock. 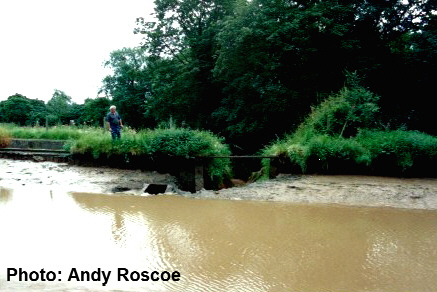 You can see from this shot, and the one below which is also by John, how the mud, silt, soil and vegetation from the canal bank above had the effect of damming the River Wheelock just in front of the aqueduct and causing the water from the canal to be channelled into the river (against the normal direction of current) through the aqueduct into the fields on either side of the river which were flooded, as was the garden of the house on the riverbank, which can be seen between the aqueduct and Nantwich Road. This house belongs to Dominic Devaney and is the household mentioned by the Canal & River Trust in early reports on the incident as being affected. 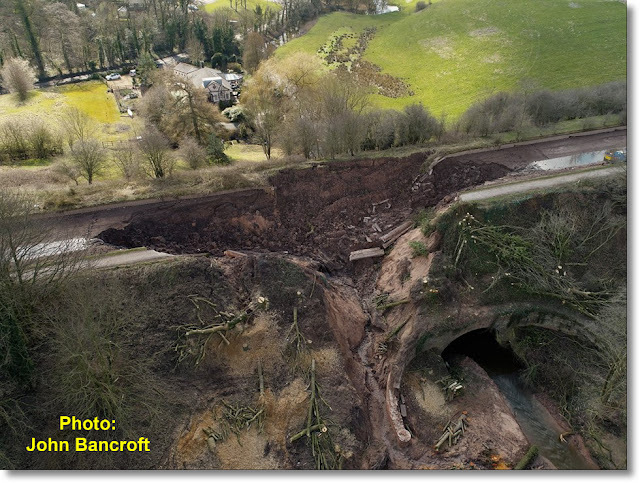 This photo, which was due to be published in the Middlewich Guardian in its 29th March edition, shows further detail of the breach. As Jim Moores of The Canals & Rivers of Middlewich points out, not only did the aqueduct stand firm, but one of its sweeping buttresses 'seems to have helped channel the water from the canal into the river'. What makes this breach so extraordinary is that it occurred on a high embankment, testimony to the comparative youth of the canal, when compared to, say, the Trent & Mersey. 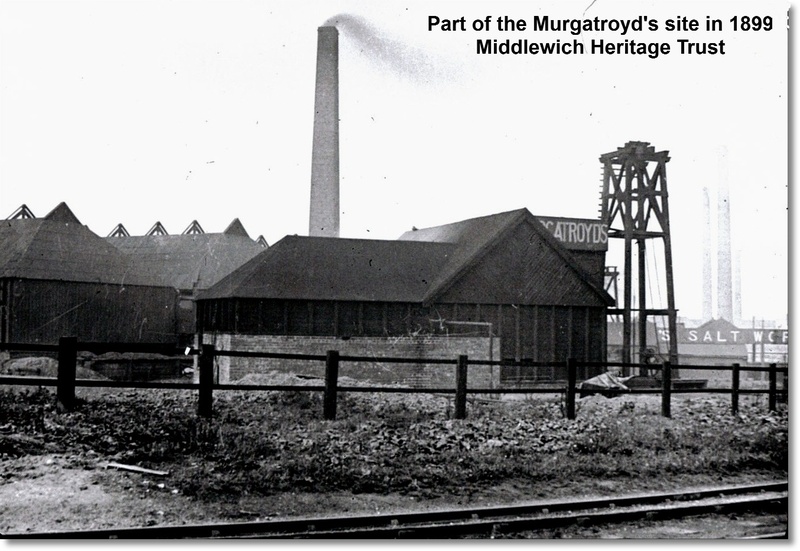 By the time the Middlewich Branch was built, the old 'contour' method of building, where the channel largely follows the natural contours of the landscape, had partly given way to new methods involving the building of high embankments and cuttings. 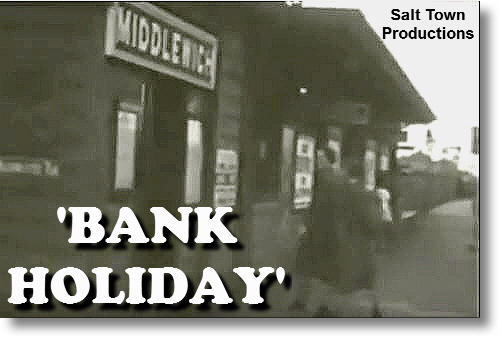 The branch opened in the 1820s at a time when railways were just coming into fashion and it's hardly surprising that the two modes of transport shared common methods of construction at that time. 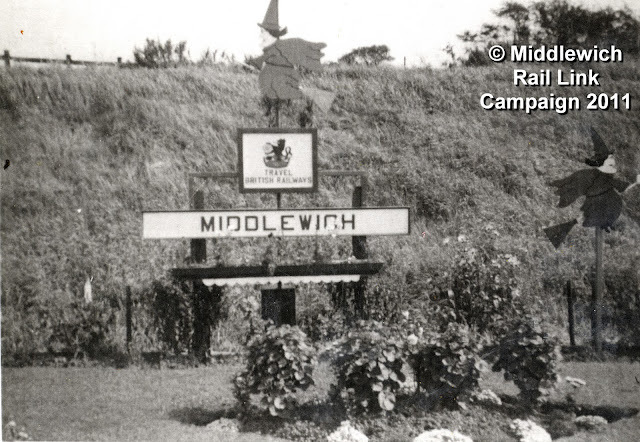 Interestingly, it was nearly fifty years after the SUC Middlewich Branch was completed that the town's railway station on the LNWR's Sandbach-Middlewich-Northwich branch line opened in 1867. 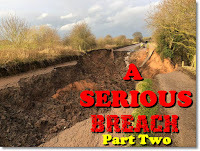 So when the breach happened, it wasn't just the canal bank, the canal bed and all that water which fell into the river valley, it was a huge chunk of the embankment too. Which accounts for the huge amount of debris now in the river, and for the extraordinarily deep hole in the canal. 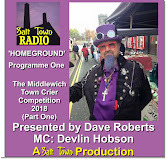 Which brings us to a point made by our old friend Andy Roscoe who lives in Moston, close to Middlewich and Sandbach, and is no stranger to the canals. 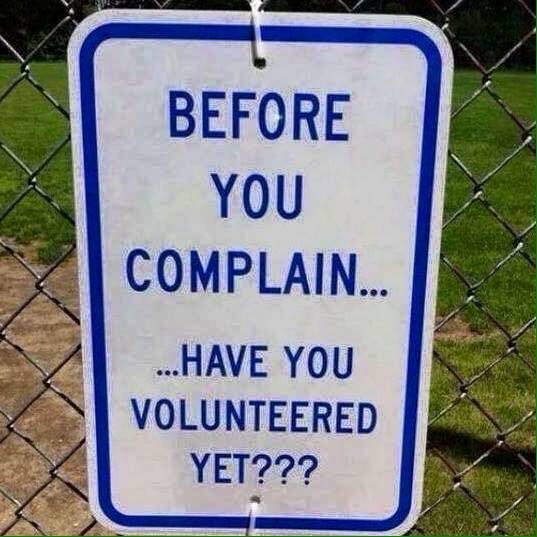 Other have made similar points. 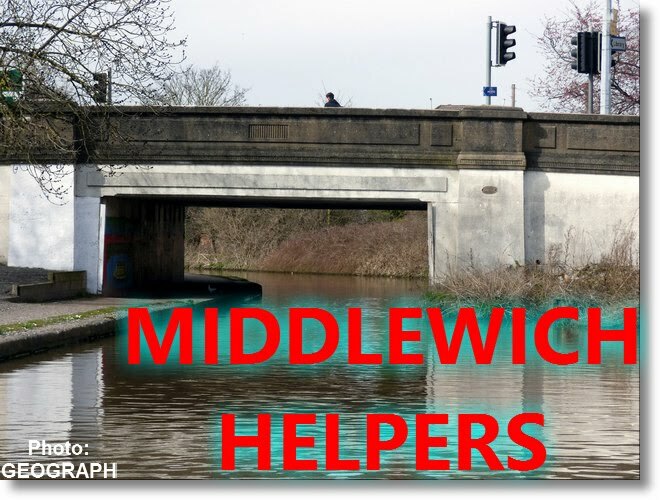 The Middlewich Branch has always been an almost completely rural canal, designed to enable boats to (eventually) reach the Trent & Mersey and, thus, Liverpool, without having to go via Chester. There was never any industry to speak of along its banks. 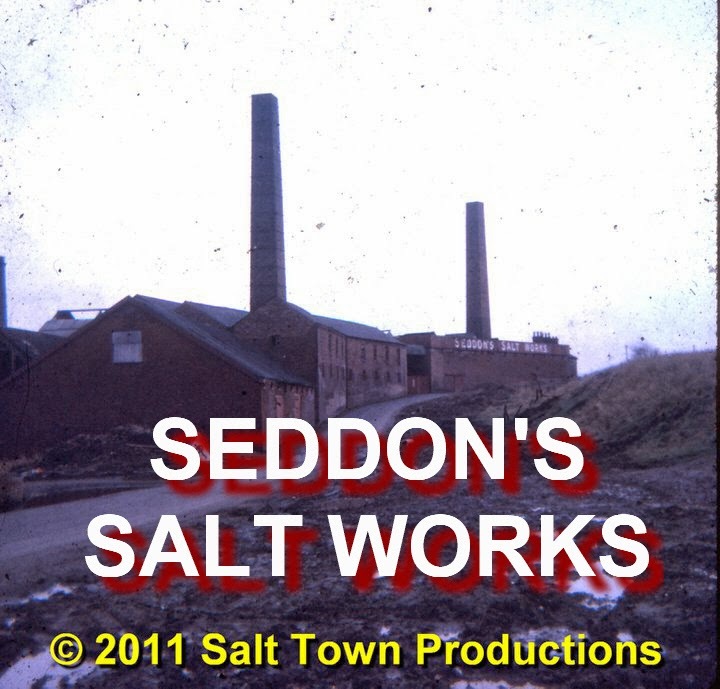 Unless, that is, you count the tannery which once stood next to Wardle Lock Cottage and later became Sutton Lane Engineering. The engineering company certainly never made any use of the canal, and it's doubtful whether the tannery before it did, either. Thus there was never much need for moorings along the canal, except at locks. The working boats would, for the most part, stick to the centre of the channel. 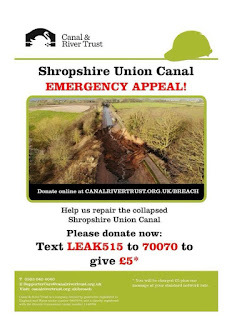 Has the advent of 'pleasure boating' helped to weaken canal banks in places - not just along the SUC but throughout the network? 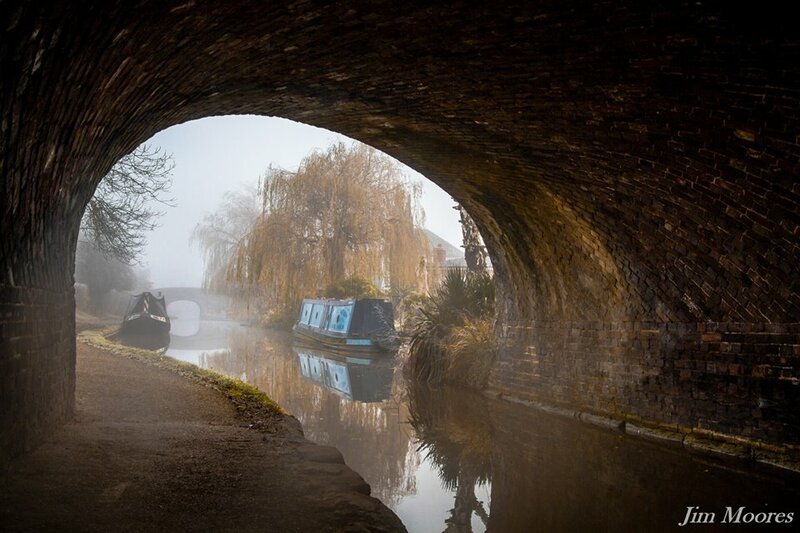 Has over fifty years of relentless hammering in of mooring pegs to enable boaters to moor almost wherever they liked helped to weaken those canal banks and towpaths? 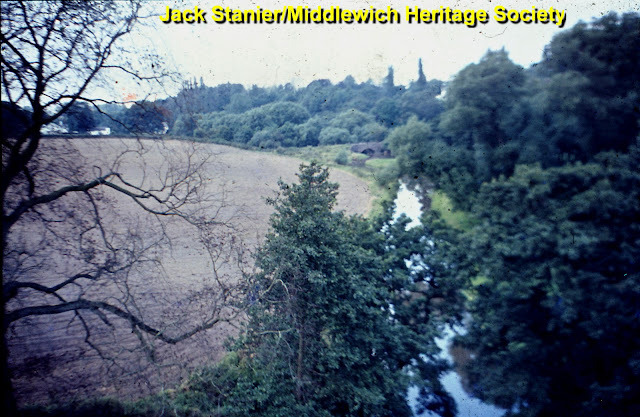 The Wheelock Valley in a long-ago early 1970s summer, pictured by Jack Stanier. The photo was taken from the canal bank above the aqueduct. 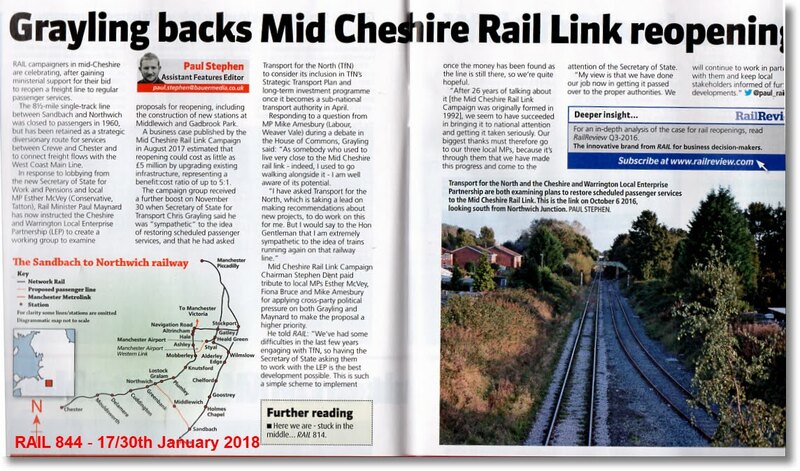 Which brings us to the subject of previous breaches along the Middlewich Branch. 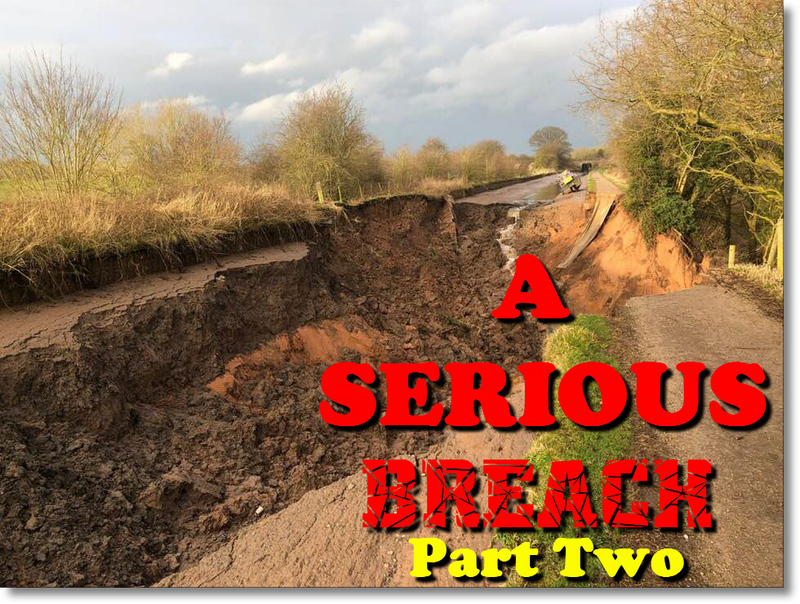 Alan Hemmings asked us if there had been a breach in the area before, in answer to which we could only refer him to the problems at Croxton a few years ago (links below). 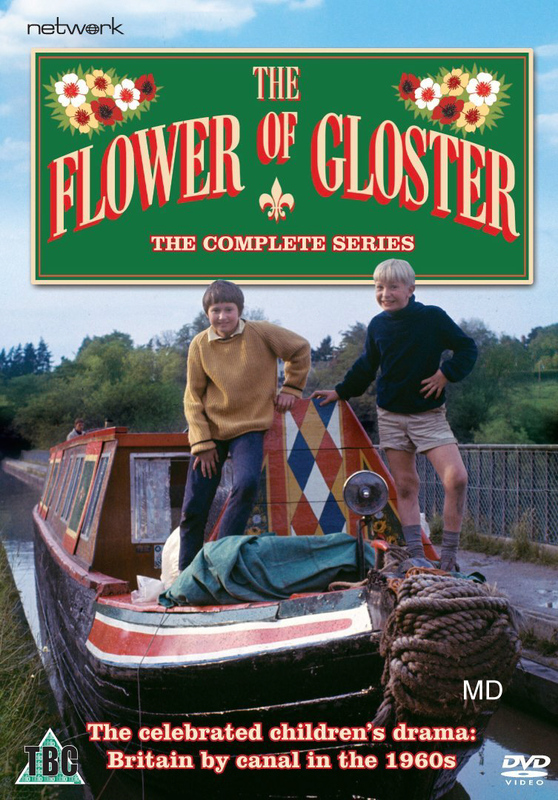 'we were caught on the wrong side of it on our first narrowboat, the Jenand(Andy's wife is called Jenny -Ed). We were picked up and given a lift back to our home in Salford by Stephen Dent. 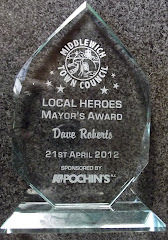 This was before Stephen lived in Middlewich'. So this was a historic event in more ways than one. 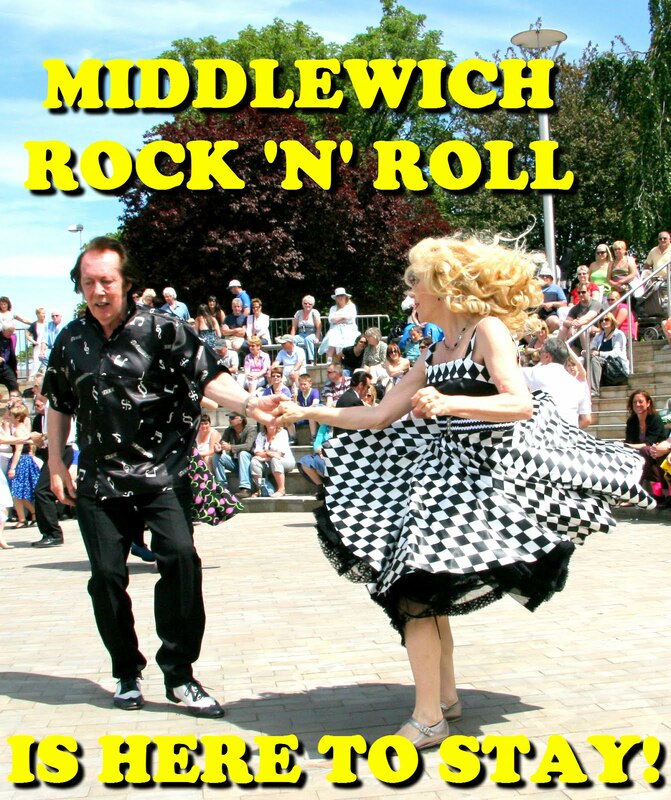 Stephen himself, ex Assistant Town Clerk, Ex-Chairman of the Folk & Boat Festival and currently Chairman of the Mid-Cheshire Rail Link Campaign, among many other Middlewich-related activities, tells us that this rescue mission was 'the first time I'd ever been to Middlewich'. Dave Roberts I know the exact date on which I first met Stephen Dent. 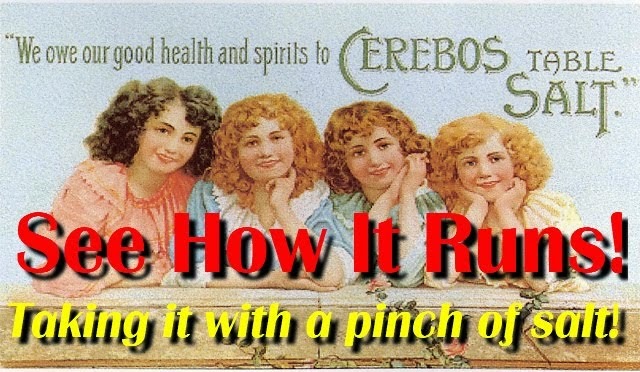 It was February 8th 1994 at the Boar's Head. I know this because I just found the script for the slide show I gave to the 41 Club on that date. What will surprise people most, I imagine, is not that I still have the script, but that there was a script in the first place. 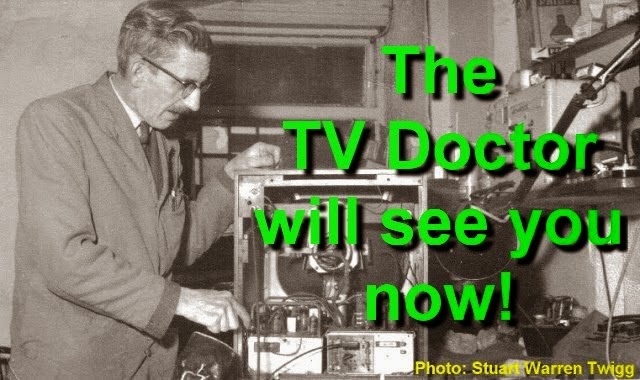 The projectionist was Will Moreton, by the way. No need for even a temporary dam, either. The canal appears to have been closed off with the ordinary 'stop planks' found at locks and other strategic places along the canal. 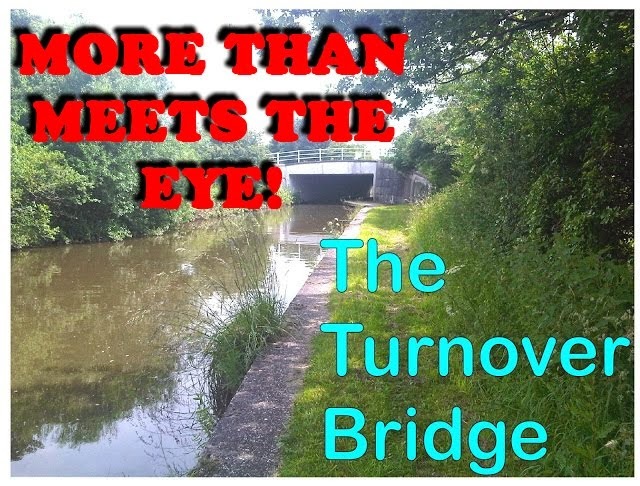 Andy remembers that the breach took place 'between Coal Pit Lane bridge and Stanthorne Lock'. Emma Westmacott who, as we learned in an earlier diary entry, was first on the scene with her husband when the breach occurred on the 16th March, tells us of family stories of a breach nearer to home some time ago. 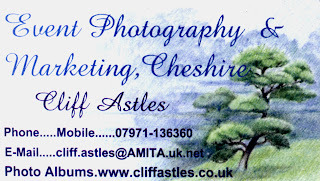 'My Grandma, Janet Sant, who lived next door to where we are on Nantwich Road, would talk about there having been a breach on the aqueduct over Nantwich Road many years ago. If I remember rightly she said that the canal emptied then, too. I've spoken to my Dad about it and he says that the incident happened in the late sixties. What happened was that someone opened all the paddles at Stanthorne Lock and the canal flooded. 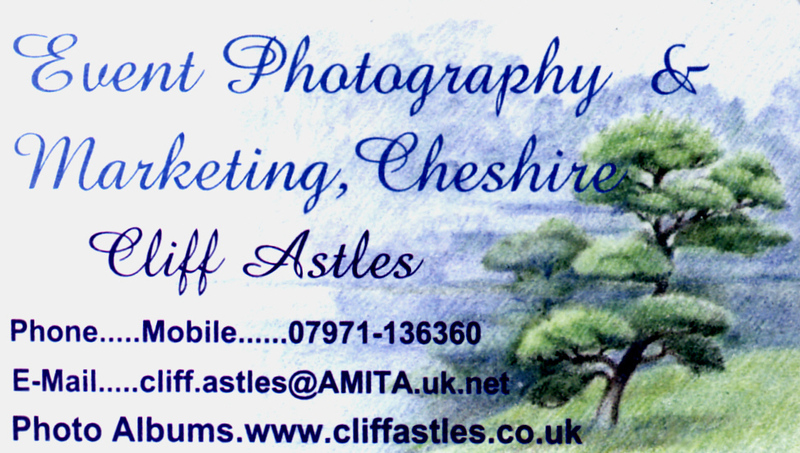 At its lowest and weakest point, which happened to be the aqueduct over Nantwich Road, all the water poured out. 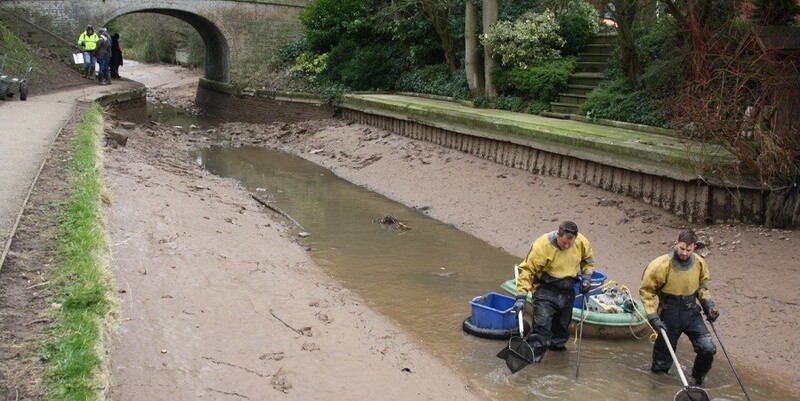 The same length of canal which has recently been drained was then emptied so that it could be repaired, and the section over the aqueduct was lined with polythene. The canal was dredged at the same time. 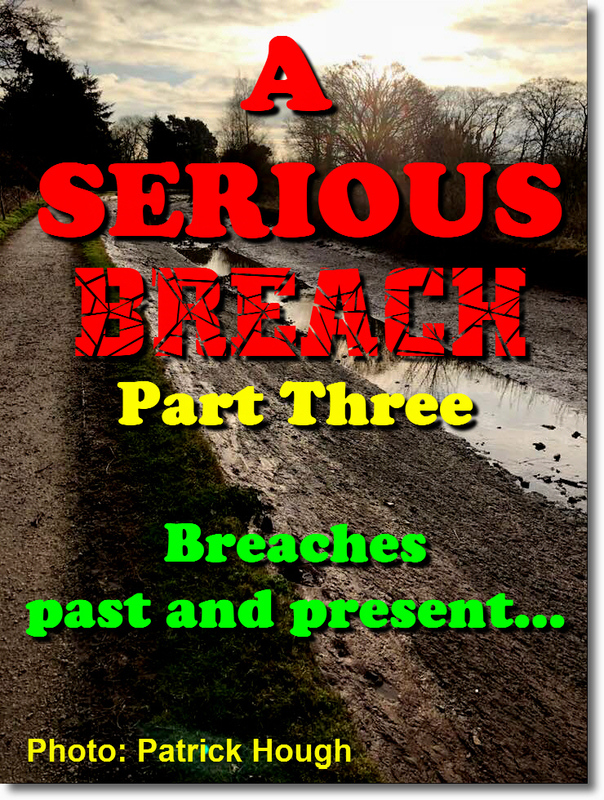 So there we are: memories of three breaches in the area in: circa 1959, the late sixties and the early 1990s. 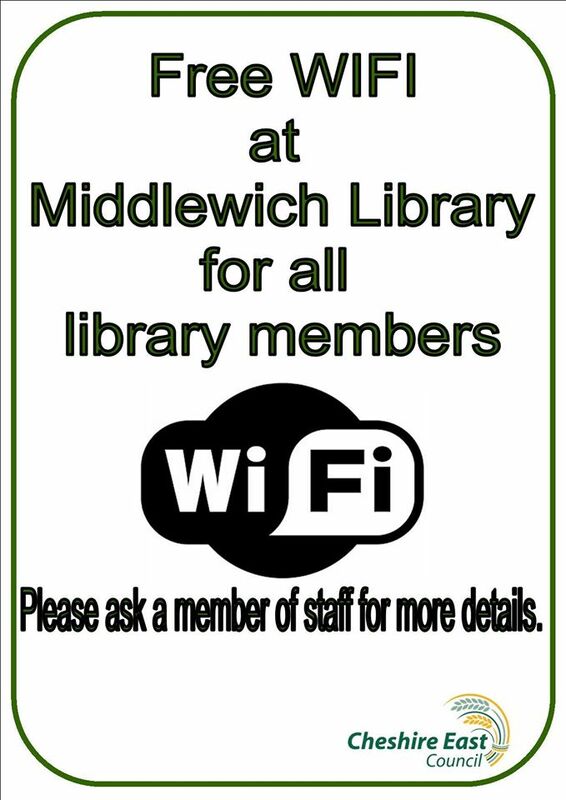 If you have memories, or better still photos, of these or other breaches in the Middlewich area, please don't hesitate to get in touch. 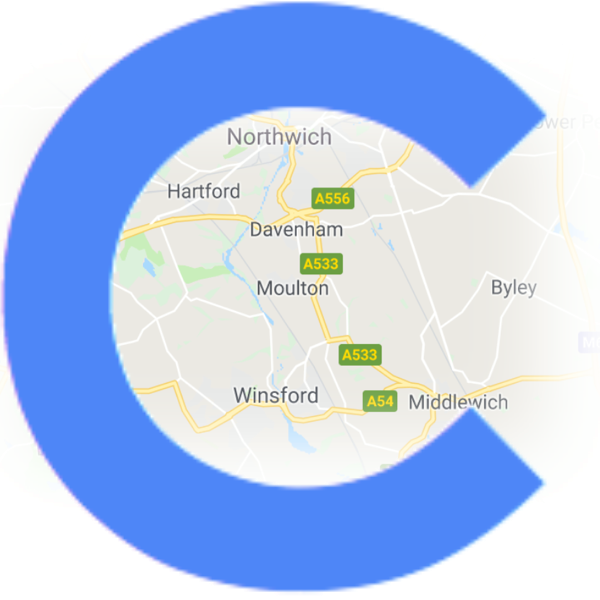 Scroll down the page for a video featuring Clive Mitchell of CaRT giving an update on the situation. 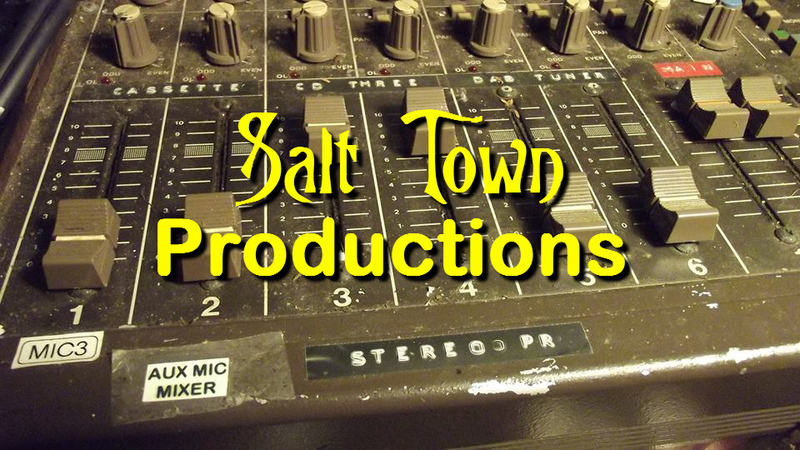 There's also plenty of other information concerning the breach on this Facebook Page. 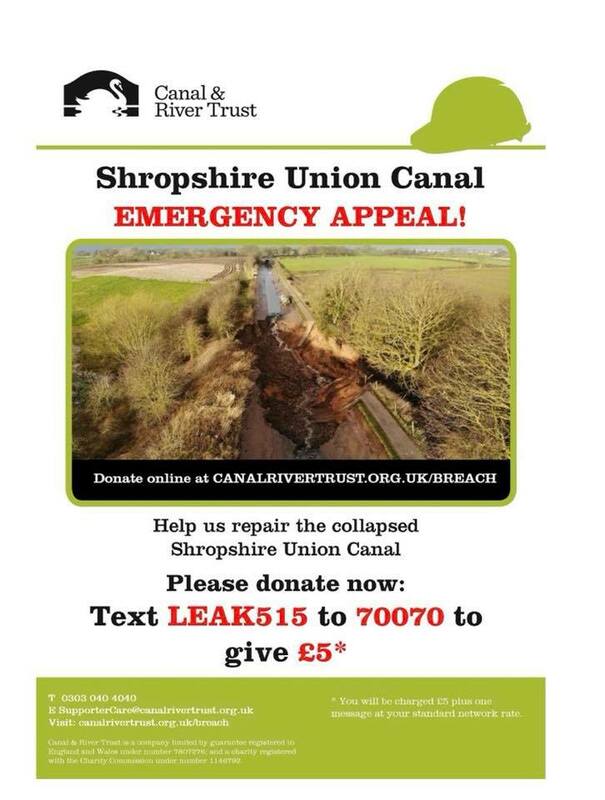 You can help the Canal & River Trust in its repair work on the Middlewich Branch by contributing to this appeal. 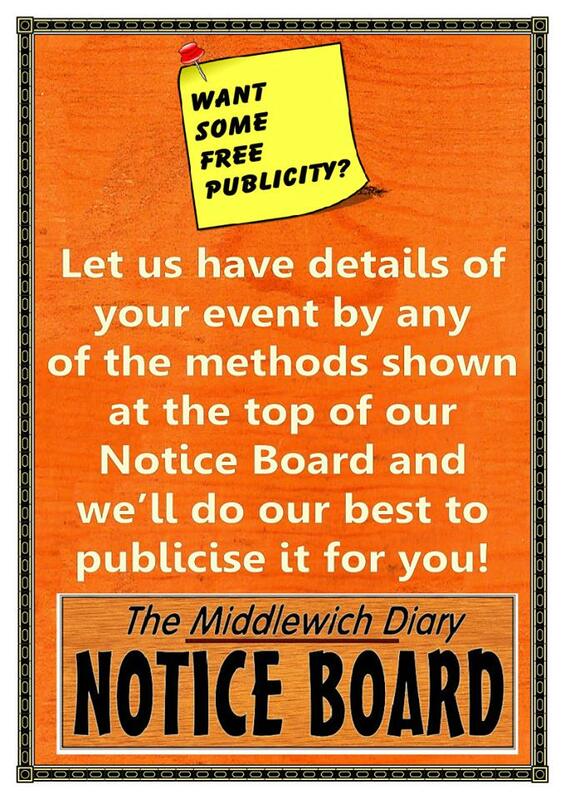 The appeal was set up by the Trust following requests from several Middlewich residents. The breach in the Shropshire Union Canal's Middlewich branch in the early morning of Friday March 16th has concentrated the minds of local people like nothing else in the town's recent history. 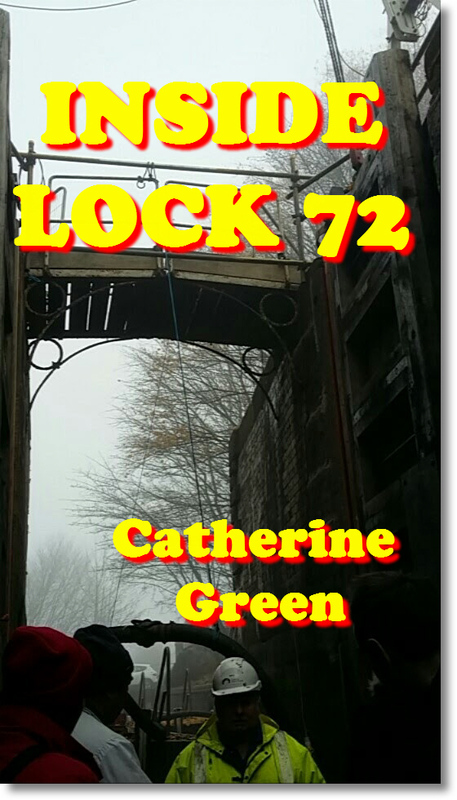 The cataclysmic event occurred without warning - although several people claimed to have seen it coming when they walked up the towpath shortly before it happened. 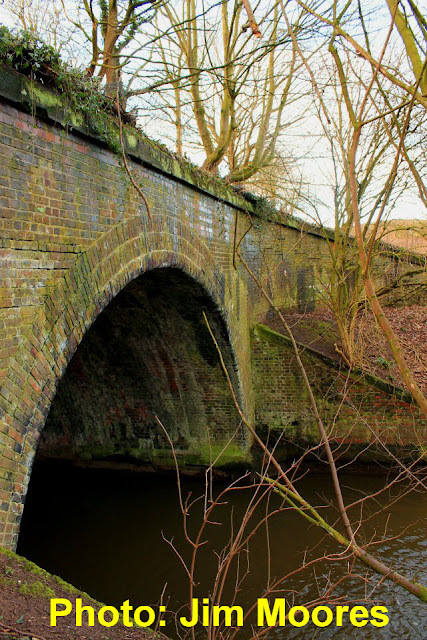 Some said that the stretch of towpath over the Wheelock aqueduct 'seemed more waterlogged than usual' and others said that activities by the local badger population had riddled the canal bank with holes, making its collapse sooner or later inevitable. 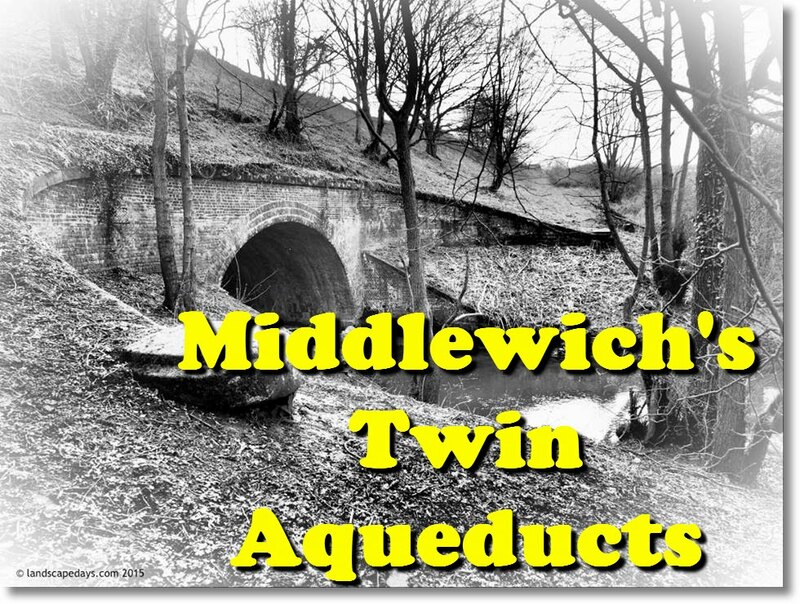 When the first reports started to appear on Facebook as the town was waking up, someone suggested that the aqueduct, rumoured by some to have 'collapsed' - and that really would have been a disaster - may have 'been hit by a truck'. Hardly likely, of course. As someone pointed out, that particular truck would have to be very lost indeed. But the comment does highlight a recurring anxiety among Middlewich people, particularly those living in Nantwich Road and the surrounding area, about the Nantwich Road aqueduct, just a few yards away from the aqueduct where the breach appeared. As we've pointed out before, the River Wheelock aqueduct and the one in Nantwich Road are almost twins - though the Wheelock structure is slightly the bigger of the two - but for obvious reasons the Nantwich Road aqueduct is much better known. The recent spate of bridge strikes by truck drivers, many of them apparently following cheap and unsuitable satnavs which show the road passing above the canal rather than underneath it, has caused consternation among many people who fear that one day the structure might be struck so hard that the resulting damage might cause a breach in the canal. Hardly likely, of course. 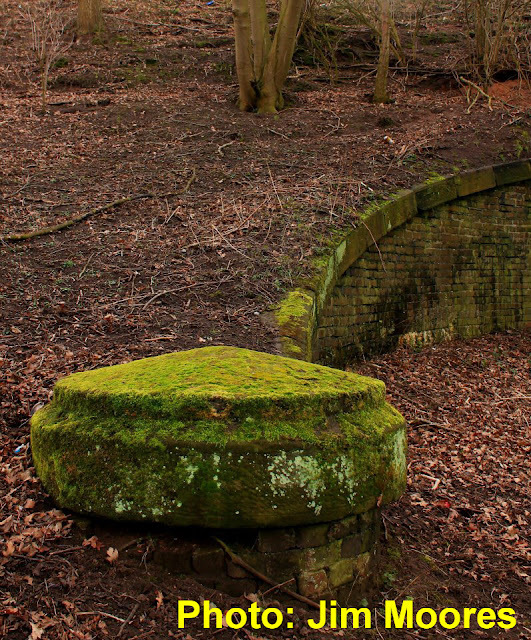 The photo below shows just what a huge and solid structure the aqueduct is. 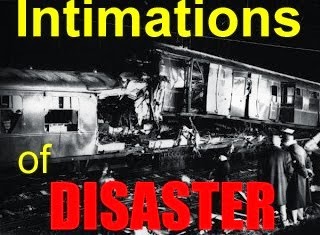 It would take a very determined effort indeed from a very large and very heavy truck to cause such a catastrophe. But that doesn't make hitting the bridge OK. Recently an Eddie Stobart driver who had found out too late that a quart won't fit into a pint pot was issued with a traffic violation notice - the first time, to our knowledge, that this has happened. The Nantwich Road aqueduct is, ironically, less architecturally ornate than its near-twin a few yards away. Its massive construction shows that it would take a very large truck indeed to make much of an impression on it. It's fortunate indeed that the bank collapse happened where it did. 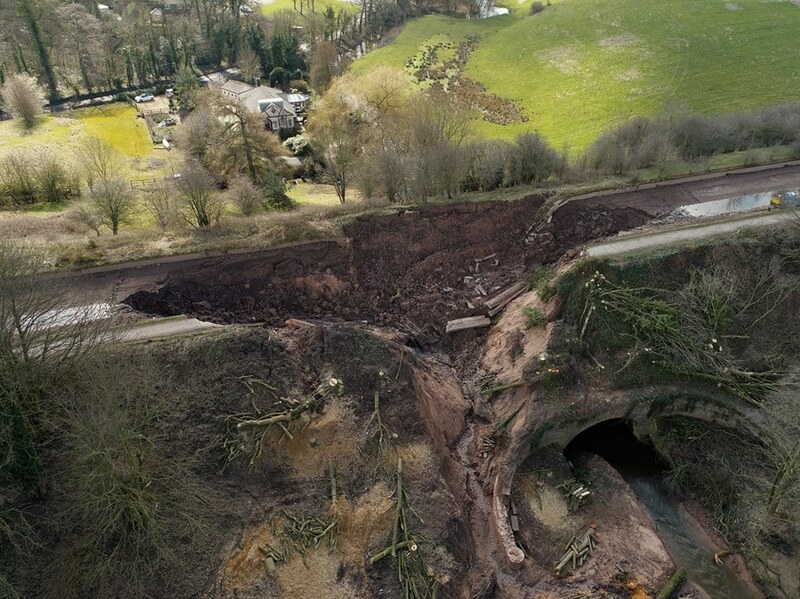 If it had happened over the Nantwich Road aqueduct the effect on any early morning traffic might have meant not just a disaster, but a real tragedy. 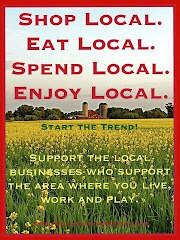 Fortunately, it didn't happen that way. Ian Murfitt It never ceases to amaze, the enormous effort that was put into building canal structures that would be largely out of public view for most of their existence. This aqueduct being a case in point. There must have been a lot of brickies around at the time. There are thousands of such examples of such structures, many of them in the middle of nowhere. 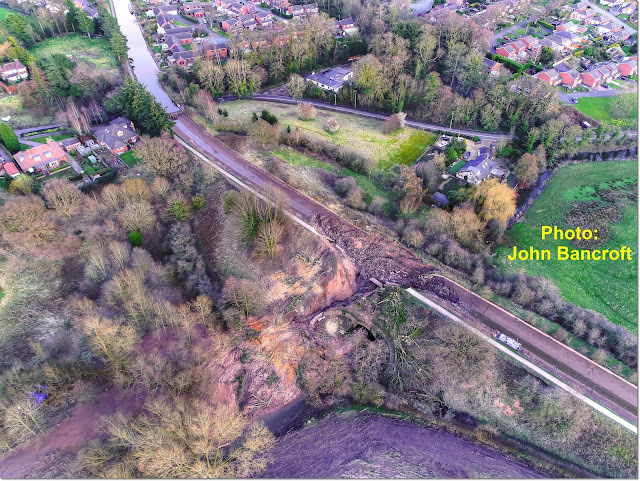 Jim Moores Judging by the aerial photographs of the breach the sweeping buttresses of the Wheelock aqueduct have survived and even helped to channel the canal water! Here's a great shot by Cliff Astles showing narrow boats on the Trent & Mersey canal at Croxton in the early Spring sunshine. The photo was taken on the Trent & Mersey and the boats shown are heading towards Northwich and have just passed the Croxton Lane tip and the aqueduct over the River Dane. Close by is the 'boat's graveyard' and a large flash, or lake. We called it 'Swan Lake'. It's a very good spot for families with children, particularly at this time of year when there are many wild birds nesting. The house in the background is the one featured in your articles about the Croxton Lane weir or 'water fall' (Croxton Hall Farm - Ed). As you know water from the Dane was used to run a mill for the for the grinding of flint to be transported by canal to Stoke-On-Trent where it was used for glazing pottery. 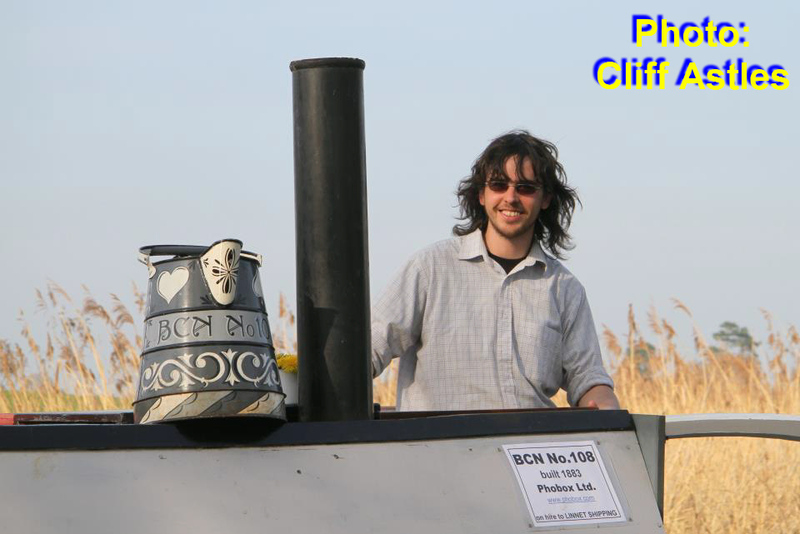 My Dad is steering the lead boat (Ariel, a 1935 Midlands & Coast Canal Carrying motor boat) and my boyfriend is steering the butty boat (BCN 108, an 1883 Birmingham Canal Navigations Day boat, affectionately known as 'Joe'. 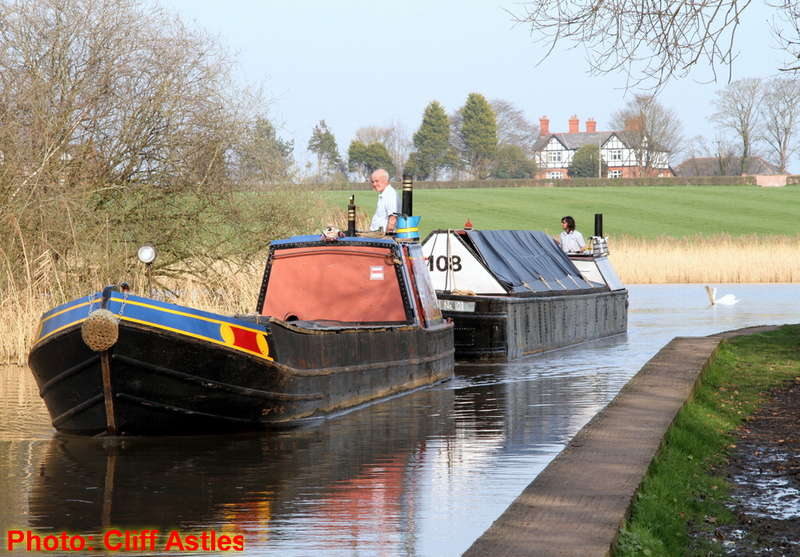 Both boats are currently working as part of Longford Canal Services and Linnet Shipping.